3-4 year old class: Introduces players to soccer in a fun filled learning environment. 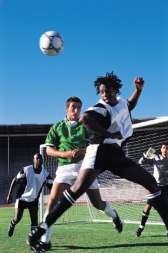 Games and activities promote soccer skills and overall athletic development. 4-5 year old class: Introduces players to dribbling, passing, shooting, and coordination and body movement activities in a fun filled environment. Games and practice activities promote soccer skills and overall athletic development. 5-6 year old class: Prepares kids for Youth Soccer League. Dribbling, passing, shooting, ball control, decision-making and creativity are emphasized. Team play is fostered through group exercises and small-sided matches. The park district offers fall, spring, and summer recreational adult soccer leagues. At the time of registration, an application and all fees are due.